I didn't use a primer. The weld cures to a hard rubber over a few days time. If you make sure to spread a coat of weld over each end, doing one side at a time, it should stay in the voids. There's also a flash line inside the voids to give the weld something to grab. 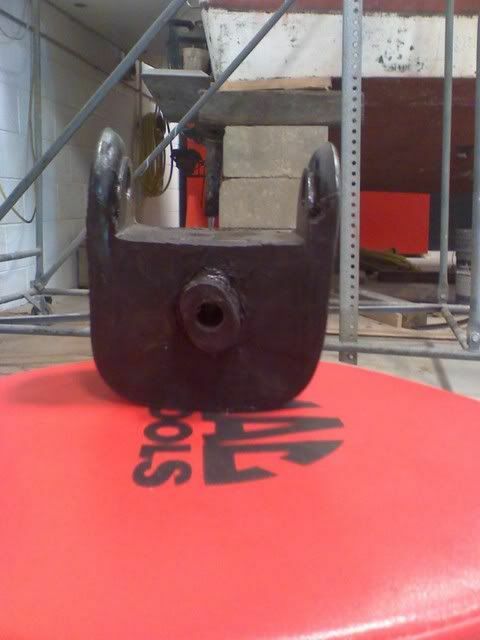 Worst case, the weld falls out and you are left with an ordinary mount. Hey guys. I need to replace both transmission mounts front and rear. The rear more so than the front. It seems like you guys have done this without an engine lift of any kind. Is this true? MrRiviera did a write up on page 4 for the rear without one. Can I replace both the front and rear mounts by supporting the engine from underneath? I haven't found a write up for the front mount. Is there anything else strange with these jobs I should know about? There is more info dealing with the rear mount after page 4 (this thread). I just ordered the rear and front transmission mounts from rock. The front one looks solid but when I opened and felt the rear mount Anchor 3065, it felt extremely flimsy and I could tell without a doubt it would be kaput in a year. I could just about dig a finger nail into it and tear it. It was also flaking black particles on my hand. Were all your guys' 3065 parts like this? It just seems flimsy and was wondering if I got one from a bad batch. Says made in India. Anchor 3065 vs DEA 3065? Any differences? Now fill it in with some liquid nails clear seal!!! Hmm, the front mount seemed way more robust and a lot harder plastic. The rear just seems flimsy. I went down to advanced auto and checked one out down there, same construction so I guess I didn't get one from a bad batch. Seems like most people are using some kind of sealant to seal these on this forum. I read here that it will reinforce it but may make for stiffer shifting. I'm sure they were designed without fill for a reason. Has anyone here installed the rear mount without any fill? James, why liquid nails? Others were saying 3M window urethane. I'm sure they were designed without fill for a reason. The most obvious reason is isolation from NVH (noise, vibration, harshness). 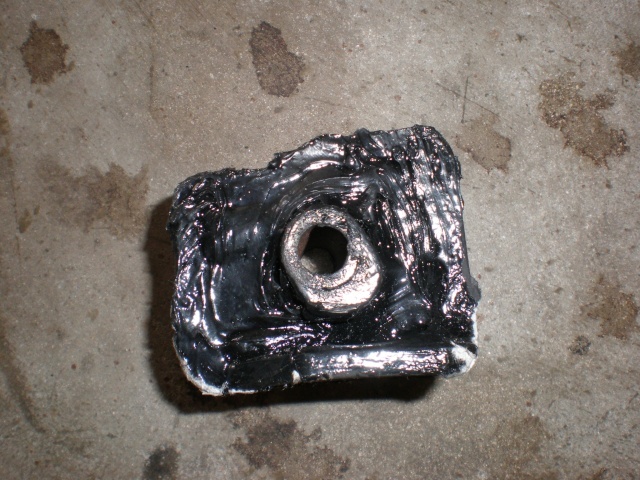 It's the same reason almost every bushing on the car's suspension is also a soft rubber material. It's the same reason the air intake uses noise silencing parts, and for the same reason the PCM tune uses very soft (slow) shifting. But as many of us have found, suppressing NVH doesn't necessarily (usually doesn't) mean the car will perform to its fullest, or have maximum durability. Softer parts wear out faster, and once they break, you'll feel the need to replace, because you were used to soft and quite. Modifying an OEM mount by filling with a harder material will increase it's life span and allow the engine's torque to be transferred more directly, resulting in better throttle response. 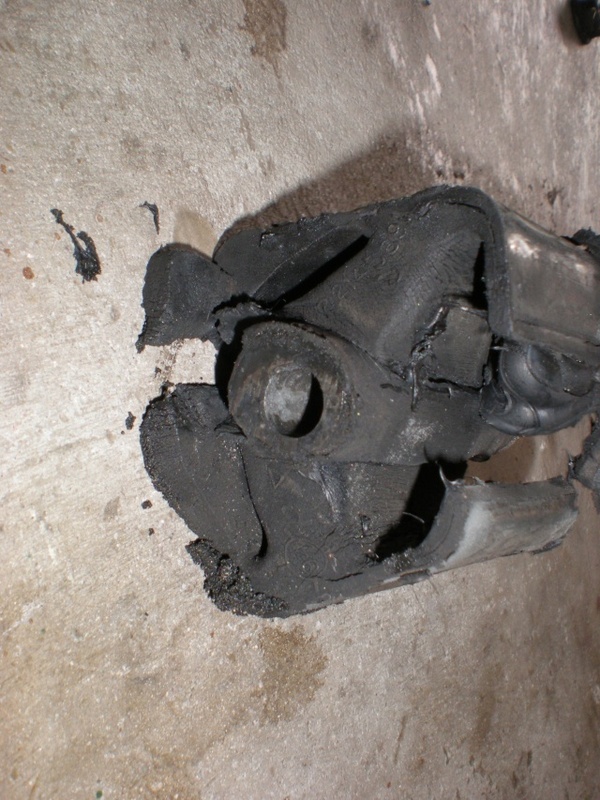 This happens at the expense of higher levels of NVH. Everyone has a different tolerance level for this, and I personally feel the Riv was designed too soft from the factory. Some can go even further than me and be quite happy with the result. Here's something you can try (at your own risk). Lock the car in 1st gear, drive it up to about 35-40 MPH, let off the gas, then hit the throttle again rapidly at this speed. The car will display a beastly amount of torque in doing this, and if you have original mounts, you'll might tear them apart, as they were never meant to take this kind of stress in addition to the age/miles they have. 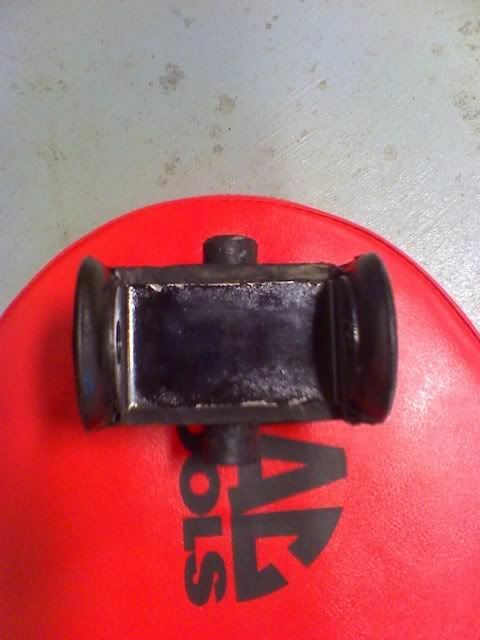 You may hear a solid 'clunk' as the rubber insulator gives out and the mount makes contact with the cradle. But if you replace the insulators with something more durable and solid, the car and the engine will gladly take this kind of abuse, you will feel the car respond better to the applied torque. It really changes the character of the car into something less soft and more spirited. Well said Aaron. Are you guys filling the front mount too? The fronts can be filled, but I felt the alternate 'hockey puck' solution works best. It seems like this idea couldn't possibly be a good one, but after completing this mod, I'd say it's one of the more reliable jobs I've done. Thanks for the write up. I just changed mine today and it was a hard job working on the garage floor. I wish I had a lift! There isn't much room to work with and all of the bolts are on there pretty tight. Just a few things I noticed on the write up. You will need a T55 torx for step 5. I ended up breaking one and had to buy another, so be careful. I was also able to remove the mount without having to lower the cradle. Thanks to VegasScott in this thread http://rivperformance.editboard.com/t882p120-faq-engine-transmission-motor-mounts#125958 for letting us know. I did have to pry up on the steering rack to get enough clearance around the power steering lines to get the old mount out. Also for anyone planning on doing this, make sure to buy new endlinks ahead of time if you haven't had them off in a while. I had changed them in 2005 or 2006 and they were rusted on there and I had to get a sawzall out and cut both of the links. I had to run and buy two new endlinks before I could drive. Its a dirty job and took a while, but hopefully I won't have to mess with it for a while. NAPA stocks 3M products, found out today, that window weld is discontinued, had to recall dried up sealant in unused tubes. They recommended 3M "Ultrapro Sealant", p/n 08300, which is a firm sealant for body joints. $28.00 @ tube!! So bought a tube of it to try on my fwd and rear mounts. I was at the auto paint store the other day and noticed that SEM makes a variety of automotive grade body adhesives and seam sealers. They had some other manufacturers' body adhesives as well, clearly designed for some very specific automotive applications. Perhaps something to check out at you rlocal auto paint store. Just going over this write-up, as I have to do mine soon. Header flex pipe is leaking badly, and investigating that along with a random clunk led us to discover both trans mounts were completely wiped out. Curious if the window-welded mount has held up over time? And where do you buy Window Weld? Also, I have noticed from having the subframe out in the past that the mount to subframe bolts on our '98 use a large torx head bolt, which was very difficult to remove last time I had the subframe out. I'm not particularly looking forward to this job... but it desperately needs to be done. I found that the 3M window weld is right there in spec of the 60A. Be sure to keep it warm while setting up. It's rated to set up at 75ºF ambient temp, and it will take a longer time anyway since you're filling a large space. In cold temp, it could take a lot longer to set-up. Thanks, AA. saw that. Ima be doing this inside my studio. I will make sure to keep a lamp on it to get the goo flowing and setting right. 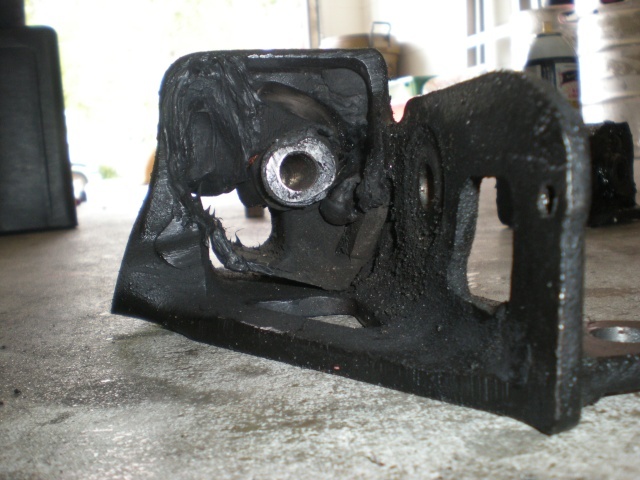 Who all has poly-u filled their passenger side engine mount? I have a spare from my previous 56k mile Riv I am considering filling and swapping. I knew I had pics of mine somewhere....found it! All I did was make end "caps" to stop the filling from falling out. I used 3M Window Weld. It takes damn near 3 months to fully cure though. I kept poking through it with really thin wire until it came out dry....like a cake. Scott, which mount is that? Rear trans? Yes, that's the front, but the rear mount is set up the same way. In reality, if you wanted to make the mount "higher" without shimming it, you could build a plate to place the center piece anywhere you wanted. You'd just have to remove all the old rubber, install the plate to hold the center in place, and fill it. You'd only have to reposition it 1/4" up, if that. The front mount on my car currently has ZERO factory rubber in it. It's all Window Weld. The mount in the pic is one that I made and sold to a member on here a while back. It still has the factory rubber in it, and was much easier to fill. If you are going to go this route, you'll need the Window Weld Primer as well. Yeah that's the front trans mount. In total that are 4 mounts and incidentally they all have their own side. The front and back both connect the transaxle to the cradle. The passenger mount connects the engine to the frame of the car. The driver side connects the transaxle to the frame of the car. So there's only one mount that actually connects to the engine itsself but consider the transaxle and engine to be one solid part for the sake of mounts. The front and rear mounts I would argue are the only ones that matter a lot in terms of taking torque and shockloads from the drivetrain. The others are more position or orientation mounts so I wouldn't worry about filling those.